Wimbledon is famed for the tennis championships – however the beautiful has many more things to boast about! The town, located in South West London, plays host to many different types of wonderful architecture. Whether you live in a chic city apartment or an opulent gated home, shutters are a sure way to create a sense of luxury in your interiors. 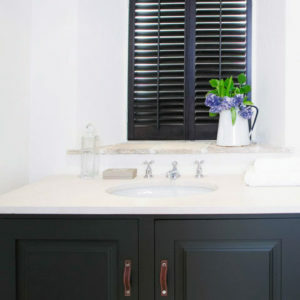 The Just Shutters Wimbledon team have a passion for design – making it their mission to provide the area’s stunning homes with perfect suited shutters. Contact Just Shutters Wimbledon to start your Just Shutters journey! Call the team on 01932 500270 or alternatively use the buttons above to book your home design visit or download a free brochure. Just Shutters Wimbledon is part of the Surrey Division – operating across Surrey and parts of South West London. Husband and wife team Simon and Georgina Broadhurst run the Surrey division. They demonstrate a commitment to design and customer service excellence at all times. -Privacy: keep prying eyes away from your home with shutters! -Durability: we offer a lifetime guarantee with our shutters. -No maintenance: next to no maintenance is required for shutters – you only need to wipe them clean.